This chapter establishes the mathematical foundations used throughout the volume. We focus first on the geometry and coordinate systems of the loop and Maxwell’s fundamental equations including material characteristics. Since energy propagates through space and through materials as waves, propagation parameters, frequency dependence of material parameters, and characteristics of materials from RF through the optical region are covered. A description of Scalar and Vector potentials paves the way for establishing the governing equations of thin-wire and thick-wire loops and rings in later chapters. Methods of coupling energy into the ring end the chapter. 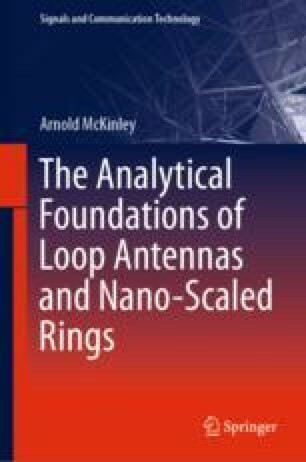 No technical distinction has been made in the literature between “loops” and “rings”; the literature seems to make a distinction based on size. Small loops, smaller than say 30 mm in circumference seem to be called “rings” more often than not, while those larger are called “loops”. All meta-atoms that appear in the literature are in the GHz and higher frequency regions and fit that description. Historically, small loops approaching this same region were used as sensors and generally called “loops”, rather than “rings”.